Cheaper and tastier than store bought and these ingredients can use whether you make quesadillas,enchilada or fajita , burrito, tortilla…you can choose and you can make any filling of your choice..
1. Mix dry ingredients in a large bowl. Make a well in the center and slowly add oil and water, mixing all the time, until dough forms a ball. 2. Turn out onto clean floured surface and knead until smooth. Divide the dough into 8-16 evenly sized portions. Add a little more flour if its sticky. 3. Cover balls with kitchen towel and let it rest for 15 minutes. 4. Heat a cast iron or heavy based pan over medium heat. 6. Cook for 2-3 minutes per side until golden blisters form . Reduce heat if blister blacken. 5. Working with one ball of dough at a time, roll it into thin rough circle using rolling pin or tortilla press if you have. 7. Stack cooked tortillas on a plate and cover to steam and keep it soft. 1. Mix the ingredients for teriyaki sauce in a bowl and marinate the beef and set aside. 2. In another bowl mix carrots, bell pepper and mustard sauce. 3. Stir fry the beef until sauce thicken and set aside. For the beef balls, mix mince beef, breadcrumbs, egg, some grated carrots and shape into a small ball and fry and drain on kitchen towel. 4. Arrange tacos in a serving platter and place the carrots, bell pepper mixture, add meatballs, avocado, cherry tomato, chili and drizzle some mustard sauce. 5. 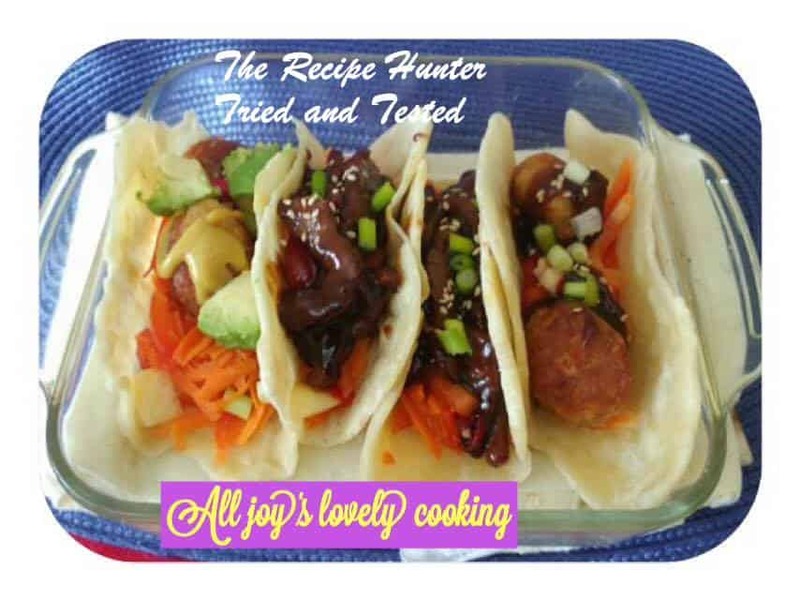 In another taco shell, add carrots, bell pepper, teriyaki beef with sauce add chili and spring onion, sprinkle with some sesame seeds.